Since Henry Coe is a huge park and it doesn't have many access points, many of its trails require a long round trip to get to. This ride could be considered a partial demonstration of that. The route is a bit like an 11.5-mile round trip to do a 5-mile singletrack ride. And that's not even the bad news. The bad news is the climb you have to tackle along the way. A touch over one half of the ride's elevation gain is undertaken in a little over three miles of the "approach" portion. More on that below. This is the second ride I've added to this site based on a suggestion by Paul Nam. 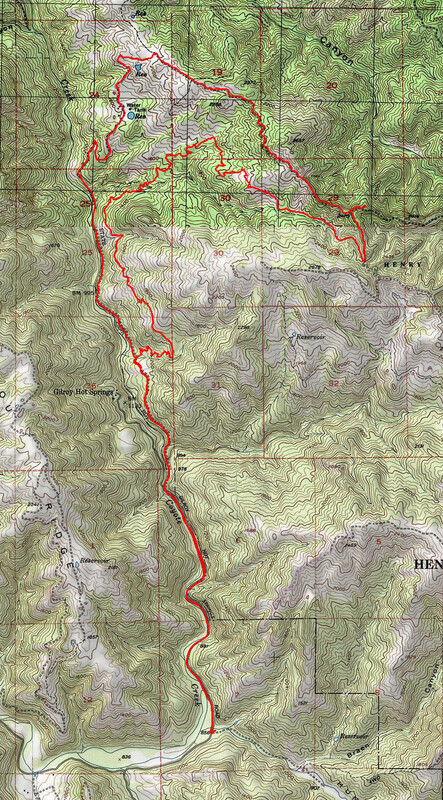 For the significance of this and for a little more about him, see the paragraph I've devoted to him in the description of the ride "Henry Coe (Willson Peak and Middle Steer Ridge Trails)". You need to park in the Hunting Hollow parking lot for this ride. Parking in this lot is subject to a fee, which I believe was $6 the last time I was there. You pay by putting cash in an envelope and depositing it in a box, so bringing with you a pen and bringing plenty of small bills would be highly recommended. Unfortunately this lot comes with no options for overflow parking nearby. Thankfully, it's a fairly large lot and it features enough space even for the creation of a pair of head-in parking rows along the middle of the lot. But, if this lot is completely filled up, the closest fallback option that I would consider arguably legitimate is to park in the Coyote Lake and Harvey Bear Ranch County Park and ride in from there. Like so many other rides that take place in the southern half of Henry Coe, the ride begins with a two-mile road segment heading north from the Hunting Hollow parking lot on Gilroy Hot Springs Road. As far as a "necessary evil" on a mountain bike ride, this paved segment is one of the most benign. The road is almost flat, it follows a valley that's actually quite pretty, following a rocky creek bed that's often picturesque, and it's almost completely devoid of car traffic. The approach portion of this particular ride continues quite a bit beyond the end of the paved Gilroy Hot Springs Road. You continue in roughly the same setting and same direction on Coit Road for another two miles. You do gain nearly 250 feet of elevation on a half-mile stretch of this segment along the way, but calling that a climb would be silly when compared to the uphill struggle that begins shortly after the four-mile mark of this ride with a bang and without any warning. In a little over three miles, you gain almost exactly 1500 cumulative feet on this tough climb. Nearly the first 2.5 miles of the climb is almost unbroken, and includes some of the toughest stretches. This unbroken stretch averages a slope of almost 10% grade end to end. That translates into enough of a suffering on its own but doesn't tell the full story. There are segments of this climb that are even worse. About the first half mile of the climb averages 12.5% grade end to end, and another quarter-mile stretch that arrives about half a mile after that first tough bit repeats that same average grade. This is a climb where slopes of 15% grade never leave you alone for long until you finish the whole thing. While you get a couple of short breathers after about the 6.5-mile mark, where the climb is interrupted, the real work ends for good only after you complete the seventh mile of the overall ride. On the positive side, the scenery continually gets better in this part of the ride. After completing that bad climb, for about one mile, Coit Road continues without any significant elevation change. This is the most scenic portion of the ride. While you can catch plenty of views of the valley of Coyote Creek and sometimes toward Kelly Cabin Canyon (even including sightings of the peak of Mount Hamilton), this highest one mile of the route cranks it up by another notch or two. Most notably, you can see the Sierra Nevada range over part of this stretch, especially if the peaks are snowy enough to be discerned easily through the haze of the long distance. You'll notice that there is a short spur on the route plot around this spot. This is intended to pay a quick visit to a vista point from which to check out the view of the Sierras (in addition to reaching the highest elevation of this ride route). I have to say, though, that the views from that spot were not much superior to what you can catch from a few places in the last couple of hundred yards on Coit Road where the trees next to the trail had enough of an opening. The thing to really look forward to at this point in the ride, though, is the beginning of the singletrack. Domino Pond Trail begins with a sharp right turn off Wasno Road after a short descent on the latter. Your singletrack descent begins at full throttle. Domino Pond Trail loses its first hundred feet of elevation at an average grade approaching -20% (while exceeding -25% at some spots, I'm pretty sure) as it follows a line very close to the crease of a small ravine in the form of a really narrow and uneven singletrack. In fact, this trail is almost never more than one foot wide. It's fairly apparent from the growing grass and dead plant matter found on the trail surface that this is not the most heavily used trail. The trail can also be off camber, which gets especially bad in some spots where half of the already-narrow trail is eroded away. All of these factors put together means that this is the kind of singletrack descent can be quite intimidating to inexperienced riders, especially in its steepest stretches. Meanwhile, other than having some difficulty at the worst of the off-camber spots, experienced riders will probably be grinning over most of the descent. There's a little bit of pedaling work to do when Domino Pond Trail starts gaining a little elevation shortly before the 9.5-mile mark of the ride and continues to do so for a quarter mile until it reaches its junction with Cattle Duster Trail. After that junction, the fun promptly resumes. This second batch of the descent is steeper on average. You quickly chain together Cattle Duster Trail and Coit Spring Trail in less than a mile before continuing onto Grapevine Trail, on which you complete the bulk of the descent. Initially you descend on a narrow singletrack that occasionally traverses grassy, open hillsides with views in front of you, while temporarily threading through some sparse clusters of trees. The trail remains narrow as you continue onto Grapevine, but the tree cover slowly becomes somewhat thicker. Something like a 500-foot segment of Grapevine Trail that ends at a creek crossing becomes noticeably more twisty and quite a bit rockier. The trail begins to follow tight curves for no apparent reason other than fun along this short stretch more than it did before, and the technical difficulty of the trail also ratchets up a little bit. This is the only part of this ride where I remember the presence of rocky, technical trail features on singletrack. The descent on Grapevine Trail continues only for a very short distance after that creek crossing and soon you continue onto Anza Trail where uphill pedaling work resumes. Anza is a narrow hillside singletrack that roughly parallels the early, flatter stretches of Coit Road while gaining elevation relatively slowly. For nearly one mile, the end to end grade averages no more than 6.5%, but that's only because the early parts of it are relatively flatter and there are flattish breaks sprinkled throughout. Otherwise, there's no shortage of short spells with 15% grade on this stretch either, or even a few spots that see 20%. Along the way, the trail alternates between tracing around the grassy, open slopes with views of Coyote Creek and passing through small clusters of trees that are tucked into the creases of the hillside. That last extended climb of the ride ends when Anza Trail reaches its junction with Cullen Trail and you start the ride's last singletrack descent. This descent takes place under the cover of oak trees from beginning to end and, while beginning with a short and steep stretch where the grade exceeds -20% at least a few times, its remainder doesn't see slopes any steeper than -15%. Meanwhile, the trail surface is almost completely non-technical and smooth. At the end of this descent, you'll find yourself on the flat part of Coit Road that constituted part of the "approach" leg of the route and, after making it over the few hundred feet (of distance) of a climb on Coit Road that greets you right at that spot, all that remains will be the nearly flat return to the parking lot over Coit Road and Gilroy Hot Springs Road.